What is a qualitative pregnancy test? When to take a qualitative pregnancy test? How is a qualitative pregnancy test performed? How to read a qualitative pregnancy test? What does a qualitative pregnancy test tell? When to take a quantitative pregnancy test? How is a quantitative pregnancy test performed? How to read a quantitative pregnancy test? What does a quantitative pregnancy test tell? What do high hCG levels indicate? What do low hCG levels indicate? 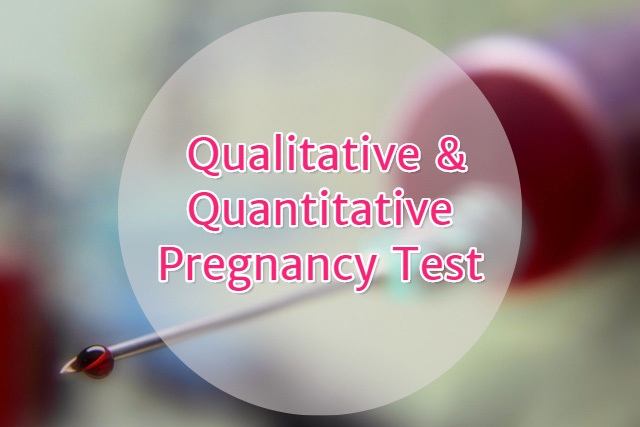 What are Qualitative and Quantitative Pregnancy Tests? A Qualitative pregnancy test only tells you whether hCG is present or not. On the other hand, a Quantitative pregnancy test tells you exactly, quantify, how much hCG is present. Both confirm pregnancy but only a quantitative test tells you how far you’re in the process. Home kits are qualitative and a clinic blood test or beta hCG tests in blood are quantitative. A qualitative pregnancy test only detects hCG hormone and shows that you are pregnant based on its presence or absence. A qualitative pregnancy test is popularly known as a home pregnancy test. The stick pregnancy test you take is a qualitative pregnancy test. A qualitative pregnancy test is the first preliminary pregnancy test a doctor recommends. It is the step before doing a quantitative pregnancy test. You have to take the qualitative pregnancy test after you experience early pregnancy symptoms. The early pregnancy symptoms include tender breasts, missing your periods by more than a week, cramps, mood swings, etc. A woman takes a qualitative pregnancy test as instructed by the particular pregnancy test kit. It is a basic procedure of exposing the pregnancy test to urine and then allowing the pregnancy test to develop results. A qualitative pregnancy test displays the result in the form of lines or symbols. If the test line appears, then the pregnancy test is positive, and otherwise, it is negative. Some pregnancy test use symbols such as a plus sign for a positive pregnancy test and minus sign for a negative pregnancy test. A qualitative pregnancy test simply tells you whether you are pregnant or not. It doesn’t differentiate between a healthy pregnancy and an unsustainable pregnancy. It might be that the qualitative pregnancy test detects hCG present due to other medical conditions such as ovarian cysts. In this case, it will give a false positive pregnancy test. A quantitative pregnancy test is a test which estimates and quantifies hCG present in your blood. A quantitative pregnancy test validates healthy progression of your pregnancy. A doctor performs the quantitative pregnancy test using advanced medical assays. A quantitative pregnancy test comes after taking a qualitative pregnancy test. You’ve to go to the doctor whether you get a negative pregnancy test in spite of pregnancy symptoms or a positive pregnancy test. A blood test is done for performing the quantitative pregnancy test. Doctors withdraw a small volume of blood for performing the quantitative pregnancy test. He will insert a needle into the superficial vein of your arm near the elbow and then cover the puncture. You don’t have to follow any particular instructions like fasting. Then your blood will go for testing, and you will get the reports after a day or two. Usually, you don’t have to interpret a quantitative pregnancy test as the results are written in the report. If hCG levels are below 5 mIU/ml then you are not pregnant. If the hCG level is between 5 mIU/ml to 25 mIU/ml then repeat the test. Levels of hCG above 25 mIU/ml show that you are pregnant. In early pregnancy hCG levels reach 1200 mIU/ml and double every 48 hours. A minimum 66% increase occurs within 48 hours. When hCG level is between 1200 – 6000 mIU/ml then it doubles in 72 hours. If the hCG level is higher than 6000 mIU/ml, it takes about four days to double. The hCG level goes on increasing with the progression of pregnancy. Depending on the hCG level obtained a quantitative pregnancy test estimates the stage of pregnancy. It is always recommended by medical professionals to verify the results of a qualitative pregnancy test.